The brilliant Discovery Museum in Newcastle approached me looking for ideas for a LEGO event as part of their “Play + Invent” season. We explored several concepts for the event, and settled on the concept of a LEGO map of Newcastle which members of the public could come and build a reimagined version of the city on top. Entry to the museum itself is free, and the team at the Discovery Museum we’re looking for special events to boost attendance in a traditionally quiet period for the museum in January / February. A day of consultancy was set aside to help the museum plan the event, and provide advice on event naming and marketing, too. 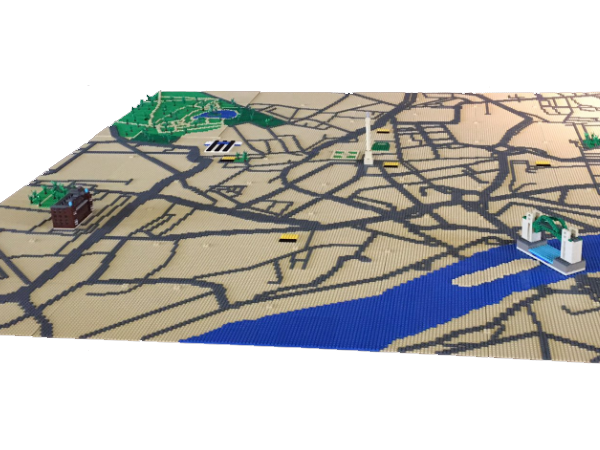 In the months and weeks before the event, I built a large LEGO map of Newcastle upon Tyne, featuring major streets, parks and other natural features. The final map measured 2.25m x 2.25 metres in size, and featured an estimated 8000 LEGO elements. The event lead to a huge uptake in tickets and attendance, as well as supplementary income for the shop and café onsite. The event was ticketed to help us organise the day in to sessions, and we gave visitors on the day free reign to build whatever they saw fit in LEGO. With a little help from around 40,000 LEGO bricks on hire, families were given a cup of bricks to get them thinking about what they could build. Plenty of LEGO bricks were available around the room to add to their masterpieces, too. A sea monster, because the River Tyne was a little bit too calm for their liking! If you would like to discuss a similar LEGO event project, please do get in touch.